Read Mike Yardley's story on his visit to Larnach Castle and the Otago Peninsula. 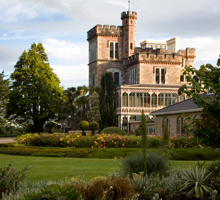 Larnach Castle won the Excellence Award for Tourism in the Westpac Otago Business Awards. Descendants of Larnach Castle architect Robert Arthur Lawson; Rob, Sam and Jim Lawson, visited the Castle in October 2018. The Board of Dunedin Host is pleased to announce that Norcombe Barker, Executive Director at Larnach Castle, has been awarded the recipient of this year's Michelle McCormack Award. The outlines of a 90-year-old feature of the Larnach Castle garden emerged from the undergrowth yesterday in a dig organised as part of Archaeology Week. After an absence of about a year, the New Zealand flag is again flying above Larnach Castle. Larnach Castle executive director Norcombe Barker, pictured in the stables at the castle, is pleased to have William Larnach's silver-topped riding crop back. “Landmarks Whenua Tohunga is an exciting venture telling Aotearoa New Zealand’s defining stories and bringing our country’s history alive,” said Paul James, chief executive Manatū Taonga Ministry for Culture and Heritage. Larnach Castle has hosted a ball that was a celebration on a range of levels, writes Shane Gilchrist. Listen to Margaret Barker on the history of Larnach Castle, RNZ Sundays with Wallace Chapman. High spirits and hot haggis were the ticket at Larnach Castle this weekend for the annual Cadbury winter ball. Lichen, we do it well at Larnach Castle. But what actually is it? Sometimes the imagination is more effective than the latest special effects at furnishing ghost stories. That is why storyteller Brian McNeill says there will be no spooky artificial sights or sounds added tomorrow night, when about 70 people celebrate the longest night of 2017 by listening to Victorian ghost stories at Larnach Castle. Tripadvisor has named New Zealand's top 10 landmarks for 2017, with Larnach Castle coming in at 5th place. Why do plants seem to flower so late at Larnach Castle? News from the Garden! Why do plants seem to flower so late at Larnach Castle? Fog? Altitude? Our maritime climate? Fiona Eadie, Head Gardener at Larnach Castle, takes the question to task in her latest contribution to our blog. As I dine by candlelight in New Zealand's only castle, with a chill wind whistling and moonlit clouds scuttering across the sky outside, I learn of a tragic and scandalous history to rival any Gothic romance. I was asked the other day "what’s the best plant in the garden at the moment". I was working in the rockery at the time and was about to say 'Well, we all like different types of plants, so what is my favourite may not be yours. Go and have a look around and let me know what you find', while secretly thinking something completely different. Stuff.co.nz: The King and Queen of the castle: 50 years at Larnach Castle. On March 3, Dunedin’s Barker family will celebrate 50 years of blood, sweat and tears restoring and commercially operating the 147-year-old castle. Passengers and crew of mega cruise ship Ovation of the Seas enjoyed an unplanned night in Dunedin last night. Look for the glow around you and keep a wary eye out for the 'plant-stalkers'; the latter we want to nab and the former we need to just enjoy as they give to us a spot of 'sunshine' at ground level. Kiwi Living's Tony Murrell visits the gardens at Larnach Castle. “Within Dunedin is Otago Harbour for Water Type Pokemon, Otago Peninsula for Rock Type Pokemon, and Larnach Castle for Ghost Type Pokemon..."
Teddies were joined by kangaroos, elephants and all manner of soft toys, turned out in their finest foil glamour-wear. At the center of the romance: the lovers. Vying for equal attention these days: the castle. Castles in the United States and abroad have become popular wedding sites, in part because they show up in living rooms and movie theaters on a regular basis. Perfection doesn’t come without effort. The view through Laburnum Pergola at Larnach Castle is a photographer’s dream, it showcases vistas of the city at one end of the arch and the castle with the fountain in foreground at the opposite end. Larnach Castle became the first subject of a new device that allows live-streaming of video from a drone directly to Facebook. One of many to press the ‘‘like'' button was Facebook chief executive Mark Zuckerberg. After a year of planning and two months of work, the refurbished music room at Larnach Castle recently reopened to the public. Kim Dungey, from the Otago Daily Times, looks inside. A smartphone application launched at the castle this week allows it to be experienced as the bustling stately residence it was a century ago. A descendant of William Larnach had long dreamed she would be proposed to at Dunedin's Larnach Castle, but thought it would never actually happen.